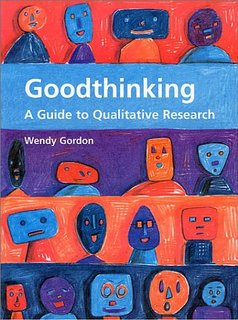 Goodthinking is Wendy Gordon's personal guide to qualitative research theory, methods and practice based on 30 years' experience in the field. This easy-to-read book charts the birth of qualitative research, its growth and subsequent maturity as a recognised component of the marketing toolbox. It also provides valuable insights into how the author's thinking about qualitative research has evolved in response to the changing demands of the marketplace. The main qualitative methods are reviewed, with a particular focus on group discussions and how best to use and moderate them. There are also chapters on effective communication, projective techniques, models of thinking, advice on dealing with the pitfalls of stimulus material and positionings/propositions, lateral ways of dealing with brand development, and much more. This important book is required reading for everyone who practices or has a professional interest in qualitative research. It is also a must-read for all those who commission and use qualitative research, particularly branding and marketing professionals and advertising agency account planners. Published August 1999 by Admap. Goodthinking is the perfect name for this great new book. The book helps researchers to think in new and exciting ways using an approach that is both theoretical and practical. Wendy makes it clear that the skill of the researcher, whilst dependent on good technique, is ultimately judged by the quality, originality and clarity of the thinking. Another essential for the qualitative researcher. Stimulating, entertaining and provocative. This has to be the definitive book on qualitative research. It is a must read for anyone involved in research and will be central reading for anyone entering the communications industry, whether researcher, planner or buyer. Wendy has left the research industry with a qualitative bible which even highly experienced researchers will want to keep by their side for reference. This book will remind everyone what qualitative research is meant to be about and how it ought to be done – things we too easily forget. This book covers the landscape of qualitative research in a way that inspires the reader new to the subject and stimulates the experienced researcher to think more deeply. Even after 20-plus years' involvement with research, I found my knowledge both challenged and increased.